A fantastic cooperation. The new global brand 'wOrk' offers the most beautiful ceramics in China combined with the most beautiful Dutch Design by Olav Slingerland. The wOrk Spoon pendant is shaped like a spoon, a universal utensil across cultures and a great symbol for the cooperation between designers Olav Slingerland and Zhu Xiaojie. The miniature spoon (10 cm long) is made up of different layers of coloured porcelain, that make you think of the growth rings of a tree. A unique pendant in six different colors, including this one with a white bowl with blue-green. The wOrk Spoon pendants come with a leather necklace (cm) and in a matching box. A spoon is a universal utensil across cultures. And for that reason also a perfect theme for a pendant in the cooperation between designers Olav Slingerland and Zhu Xiaojie. The inspiration from nature can be seen in the color layers of the Spoon rings that have a strong resemblance to the growth rings of a tree. Unique pendants in six different colour schemes – a light grey spoon with a different colored bowls and color rings around the bowl. 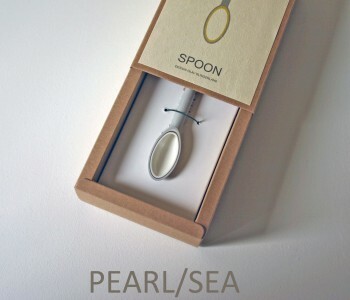 The wOrk Spoon pendants come with a leather necklace (cm) and in a matching box. At the invitation of designer Zhu Xiaojie (CN), Olav Slingerland (NL) left in 2015 to China to work together in Xiaojie's ceramics studio. Their joint research into the language of clay, in which they shared their love for the material, nature, and the essence of good design shared, culminated in a cultural cross-pollination, which forms the basis of the brand wOrk and which is expressed in a distinctive design style. The pure and honest material in a bright and contemporary design, that is at the heart of wOrk. Olav Slingerland studied at the Design Academy Eindhoven, where he experienced his introduction to the ceramic process. During his education, he became more and more excited about the casting of clay. Olav has translated his fascination into a whole range of special designs – from Pisovase to Puntbowl and Flow and Still vases and bowls to the Homework series. The cooperation with Zhu Xiaojie has led to a whole new set of more detailed designs under the umbrella of their joint brand wOrk.